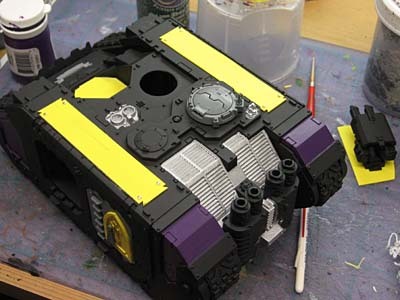 From the Warp: Conversions: Can you "see" the end result? Conversions: Can you "see" the end result? I was thinking about this while I was working on a Land Raider Crusader. I'm at the point where I'm painting it, but I stopped and looked at what I had sitting on my desk in front of me and thought about how it's going to look in the end. I realised that the steps I'm taking now, while they don't immediately make it look finished, are smaller steps towards getting there. But it's not just the painting, it's the construction of the thing to. Following the instructions in the box gives you the results in the picture. Converting is another thing all together. There are no instructions to follow, no guidelines to get you to the results you want. But I know this model will work because I can "see" the end result in my head... despite what's sitting in front of me. I always figured everyone could do this. You know, imagine what something will look like when it's finished. But not everybody can. I can only "imagine" that it's that much harder if you can't see the end result in your mind while you're working on something, especially a conversion or scratchbuild where you may not have directions for the thing to begin with. So I stand here at my desk, frantically working, jumping from paintbrush to paintbrush, color to color, working on this Crusader. Some parts I know to wait until later to paint, some parts I finish right now. Certain things are left until the end to build, some are complete but just not attached to the model. "How do you even know what you're doing?" I'd have to tell her, "Hmmm... good question Dear, I'm using the force." Actually I'd ask her, "What, you can't tell?" and fake some kind of disgust to which she would probably just smack me and tell me to get back to work. I wish I could have seen that coming. Yeah, I get that feeling too. It's usually about the halfway point during the painting process with most of my projects. Unless it's a particularly conversion heavy model or mini, in those cases I can envision the finished product before the primer hits them. It's a funny thing - usually I envision most of a conversion or painted figure before I start on it, and then just fill in the blank areas as I plod along. Sometimes with painting, it's not so much even seeing the figure as such, but just sort of "knowing" what color ought to go next, and then the one after that, and then a glaze or two, etc. Recently, I've found I've gotten a lot of inspiration lately just going through my muddled collection of bitz and sorting/reorganizing them into new sectioned containers - I come across a piece I'm not familiar with or one I'm seeing in a new light, and immediately I can see in my head where it would slot in as-is or look good cut up and plugged into any of the 5 or 6 conversion ideas I've had running in the back of my mind lately. I think the down side of being able to mentally envision your expected end result and just sort of "knowing" vaguely how to get there is that it makes it occasionally difficult to explain what you're doing to anybody else until you're nearing the point where it's mostly come together physically - by which time it's usually too late to go back on a "bad idea that seemed good at the time." I luckily haven't had many of those, I think, but I'm not nearly as adventurous as some. with conversions i feel you have to have a good idea of what your trying to achieve or the whole thing runs the risk of becoming a mess and a possible waste of minis and bits... but i also do leave room for adhoc changes. its also important i think to be ready to ditch an entire idea at an early stage if it going to be to much or is unworkable... ive had a few of these in my time and ruined really good minis because i didnt stop when it was obvious all the forcing and praying in the world wasnt gonna save the project. Oh I don't pretend to know what you're going to do next, but I think it's a safe bet that the L.A. Lakers are gonna be thrilled with their new Crusader. Mr. Esty: I've got a lot of leeway with my Client who's getting this LRC, but I don't think he'd be too thrilled with it like this. It's actually finished now and I'll have pics of it on Sunday. Of course I've got a bunch of WIP shots so I can show the process in another post later on. Interestingly enough, I can't visualize, I have some Mark 6 Marines (Beakies) that I am painting in Sable Swords Colors. I had to finish one and tweak it a bunch before I found something that looked good. I just couldn't visualize the outcome before I had it painted. I envy you. Keith: That's why I posted this, because it never dawned on me that others had it WAY harder when it comes to "creating" things. I guess that's why I like tutorials that are well written with tons of pics to show how something is dmade. It really goes a long way towards helping people see the end result and get there on their own. On vehicle conversions, I usually 'cheat' and do a 3-view in power point to get a feel for the structural parts -- but I don't see the detail additions until they're realized in plastic, etc. Hudson: I cheat by holding the parts together with some blue tac and snapping a picture real quick before they fall apart. I usually see what I want to achive, in small amounts. I kinda let the model itself guide me, if that makes sense. For vehicles, and vehicle conversions I use CAD software. I have half a dozen base models that I can drop bits onto. If I get really picky I can test out paint schemes too but sometimes it is better to just dive in and try to paint schemes out yourself. For me I like to have an idea what I want it to look like, and sometimes that thought changes in the middle of the project. Most of the time I look at the model and try to get a “reading” on what color it wants to be. I think that I normally have a pretty good outcome for the finished model. But there are a couple times that I have just had to grab paint and a brush and see where it takes me with a model. Thankfully so far it has only happened three times and it has had some good outcomes. Good post Ron, makes one think about how they get from the start of a project to the finish.